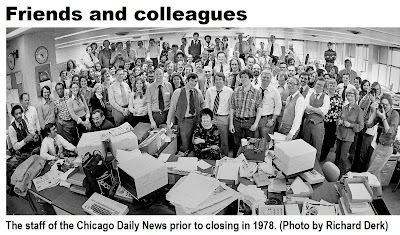 Thirty years ago, the presses fell silent for the last time at the Chicago Daily News, an iconic and crusading newspaper that was unable to adapt to changing times. The following article, which originally appeared here on March 4, 2005, is reprinted as a reminder of what happens when a paper runs out of readers, revenues and ideas at the same time. Thanks Alan for reminding me of a fine newspaper, one that shaped my formative years as I moved progressively from Buck Rogers in the comics section, through the sports as Luis Aparicio, Nellie Fox and the scrappy White Sox dislodged the hated Yankees from atop the American League -- and finally into adulthood, intently reading of the death of Martin Luther King, Robert F. Kennedy and then the memorable 1968 Democratic National Convention. I don't know what I would be today without that newspaper. Thank you for having been there. 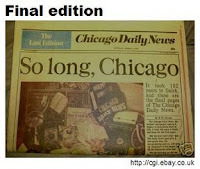 I well remember the Chicago Daily News and a feature called NewsLady. Women were paid $25, I think, if their stories were published. I had two such stories printed in the newspaper in the late 60's and/or early 70s. Is it possible to get copies of these stories from archives somewhere or are they gone forever? Do you have a list of women columnists from the 1950-1960 era? I own 2 of the last editions. great shape. Are the worth anything?